The only month of the year when a man can be a Man and grow his MO without any worries! Movember International wants us to man-up and raise funds for mens health, this is used for research on men health issues such as prostate cancer etc. 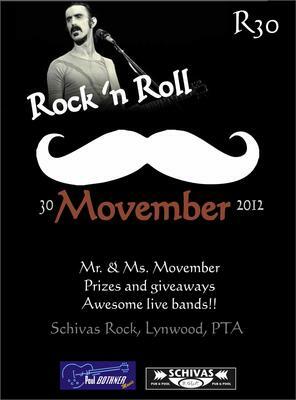 We will be ending this Movember off with a Party of note at Schivas Rock, PTA on 30 Movember 2012 with the crowning of MR & MS Movember as well as some other prizes and give-aways such as clothing, cd's as well as tattoo and piercing vouchers! Most important of all, we will have our own local music Mo Brothers on stage performing some Rock 'n Roll tunes! All proceeds will be donated to Movember Charity! Get those Mo's in shape and come and party with fellow Mo Bro's and Sistas! Sponsors - Paul Bothner Music, Rock Star Threads, Kimmis Tattoos. Join in and write your own page! It's easy to do. How? Simply click here to return to Pretoria Events November.